Iraqi security forces and militias fought their way into Saddam Hussein’s home city of Tikrit on Wednesday, advancing from the north and south in their biggest counter-offensive so far against Islamic State militants. The provincial governor said the army and militia fighters captured part of the northern district of Qadisiya, while in the south of the Tigris river city a security officer said another force made a rapid push toward the center. … More than 20,000 troops and Iranian-backed Shi’ite Muslim militias known as Hashid Shaabi, supported by local Sunni Muslim tribes, launched the offensive for Tikrit 10 days ago, advancing from the east and along the Tigris river. The Islamic State is a Sunni-Salafi Islamist organization which declared itself the “caliphate” of Islam on June 29, 2014. (Read more). The Islamic State overran Tikrit in June, 2014, in one of the deadliest battles of the ISIS surge into north Iraq. Tikrit is the birthplace of the late Saddam Hussein who likened himself to ancient King Nebuchadnezzar (Daniel 1:1) of Babylon, who besieged and destroyed Jerusalem in three separate sieges, 605, 597, 586 BC. Many of the senior members of Saddam’s Iraqi government were from Saddam’s own Tikriti tribe, the Al-Bu Nasir, and were members of his Iraqi Republican Guard, headquartered in Tikrit during Saddam’s presidency. Iraqi forces (Sunni and Shia) are now launching a counter-attack to retake Tikrit from ISIS. The primary force in the counter-attack appears to be Iranian-backed, Hashid-Shaabi (literally, “Popular Mobilization“), comprised of local Shia militias from various areas in Iraq. Iranian Quds Force commander General Qasem Soleimani was seen in Iraq directing Shia militias in their fight against ISIS militants. ISIS is reported to be straining to hold on to areas it claimed easily in 2014, including Mosul, where loudspeakers warned residents fleeing Mosul they would be considered apostates if they fled. Perhaps evidence of ISIS loosing its grip on 2014 territories gained is the destruction of ancient archeological sites in areas previously taken. Reports include destruction of artifacts from the ancient city of Dur-Sharrukin near Mosul as well as the famed Nergal Gate entry to the ancient city of Nineveh and bulldozing the site of Nimrud (Genesis 10:8-10). Daniel 11:43-45 (NASB) “But he will gain control over the hidden treasures of gold and silver and over all the precious things of Egypt; and Libyans and Ethiopians will follow at his heels. … But rumors from the East and from the North will disturb him, and he will go forth with great wrath to destroy and annihilate many. 45 “He will pitch the tents of his royal pavilion between the seas and the beautiful Holy Mountain; yet he will come to his end, and no one will help him. The nations from the East and North are significant in Bible prophecy. 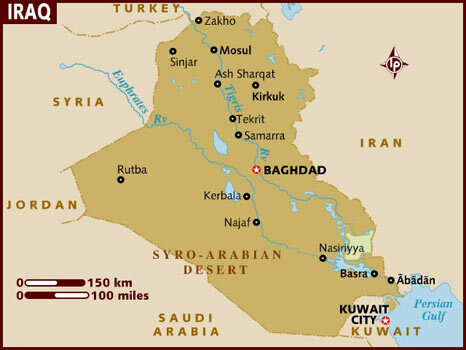 Biblically, Babylon (modern-day Iraq) is referred to as the nation “from the North” (Ezekiel 1:4, 9:1, 26:7). Persia (modern-day Iran) is referred to as the nation “from the East” (Isaiah 41:2, 46:11). Daniel 11:45 states that these two nations will “disturb him,”and this is exactly what is occuring right now. This “disturbance” will cause the antichrist-type of Daniel 11 to erupt in wrath and destroy and annihilate many. If Daniel 11:44-45 is in the process of being fulfilled by ISIS, several events must still take place before the Islamic State “will come to its end.” First, the antichrist-type must “enter the Beautiful land. (Daniel 11:41). The Beautiful land is Israel, but notice, he only “enters” the Beautiful land. The Beautiful land does not appear to fall to him as does Egypt (Daniel 11:42). Second, Egypt must fall and its “precious things” will be taken over by the antichrist-type. Daniel 11:42-43. Third, the antichrist-type must make Jerusalem his capital (Daniel 11:45); or, at least he will declare it to be so since Daniel 11:43 states he only “enters” the Beautiful land. Lastly, many countries will fall to his hand. Daniel 11:42, 11:44. 2. 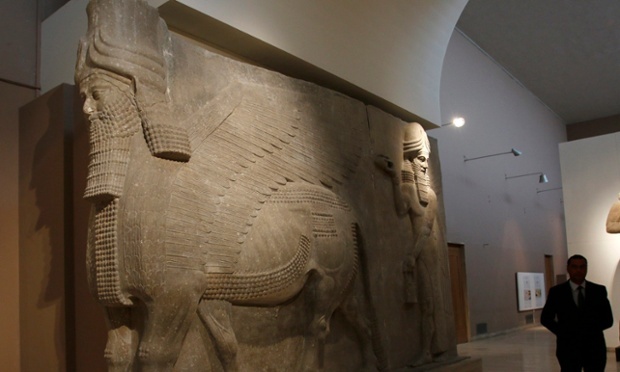 The Islamic State is already ransacking the ancient treasures of Iraq just as it is prophesied to do of Egypt. If we interpret this as a characteristic of the Islamic State for it to occur in Iraq implies it will also apply in Egypt — in due time. Daniel 11:43. Donations to Islamic State jihadists have dramatically declined in the wake of brutal executions by the group that have shocked public opinion in the Middle East, the chief of US intelligence said Monday. “I think there is change afoot in the Mideast,” said James Clapper, director of national intelligence, referring to perceptions of the IS group in the region. What this statement by Clapper implies is that in spite of the fact that ISIS has been so successful, its success is beginning to show cracks. These cracks could become more significant to the point that ISIS will ultimately lose its support around the world. This is what Daniel 11:45 prophesies. As we seek to interpret Bible prophecy, our interpretations cannot be dogmatic; but that does not mean we cannot find the identifiers and hints in prophetic passages and make informed conclusions. If ISIS is in Daniel 11, then there is much to unfold in Bible prophecy, including the revealing of the Antichrist, the last false prophet. Daniel 11:45 states the antichrist-type prophesied therein will “come to his end.” When he does, another will fill his place; for there is only one “last false prophet,” and that one will be the Antichrist. Perhaps this will be Muhammad al-Mahdi, the one “who was, and is not, and is about to come up from the abyss and go to destruction.” (Revelation 17:8). NextWill the Temple Need be Rebuilt before the Coming of Our Lord? Fascinating and compelling. I would like to know more about the role of America and other Western countries in this paradigm. I have just started the book and will be following this blog and current events closely. Hello Anonymous. The view of most is that America is not in Bible prophecy. Some have posited that America is the harlot in Revelation 17, but I find that view impossible since the text tells us that the harlot is drunk with the blood of the saints, and America may be drunk on its own power but certainly not on the blood of believers in Christ. That specific addiction is fufllled by Islam but by few others (some advocate the Catholic Church here but I also find that view not plausible. The Catholic Church certainly killed many during the Middle Ageas and prior, but their movitation was to purify the faith not to destroy it. I have written a post that America is possible being referred to in Daniel 12:7 in the words “until the power of the holy people be shattered” where America is the “power of the holy people, Israel.